My first day in Peru's Tambopata National Reserve turned out to be a bigger adventure than I bargained for. In the days that followed, I went on nature walks morning, noon, and night. As I learned on safari in South Africa, the more time you're out there looking for wildlife, the more likely you are to see a wide variety of critters and creatures. What follows are my top five wildlife moments from a visit into Peru's Amazon Basin. I have a fear of spiders, so coming face to face with a hairy tarantula the size of my hand was both fascinating and mortifying. This particular tarantula was nicknamed after chickens because of the way it's young follow behind the mother in a little line. Imagine not just one hairy, 8-legged creature, but a whole family of them! The Chicken Tarantula is not poisonous to humans, however if you get bitten by one, the nasty bacteria from its fangs can leave you with an infection that will require a trip to the doctor. 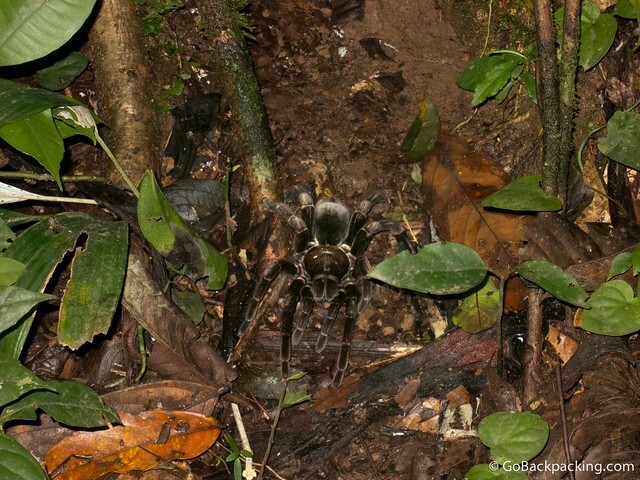 This carnivorous spider eats insects and small rodents. Our guide referred to it as a primitive, given it hunts on the ground, rather than spinning elaborate webs to catch its prey. On my last afternoon at the Tambopata Research Center, I went for a walk with one of the guides and Lainie and Miro. We took a boat to a nearby island on the river, from which we began scouting for birds back on the mainland. 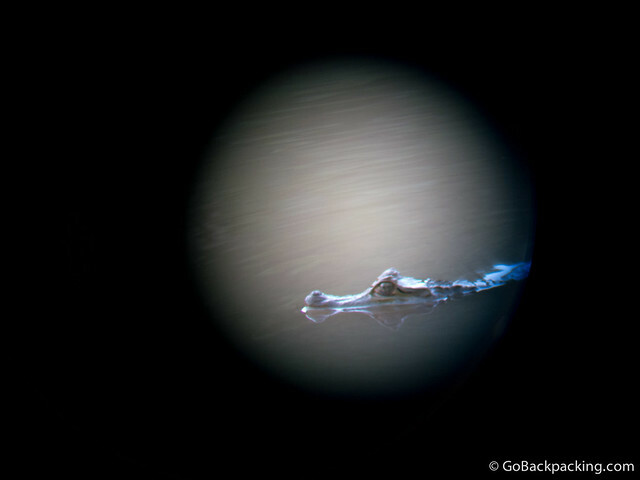 It was just before dusk, and we noticed a small Caiman slip into the water, and begin to slowly cruise upriver. And then it began fishing by jumping out of the water and diving back down. The form this reptile took was akin to a dolphin jumping in and out of thew water. It was not at all what I'd expected a Caiman to do. Because he was so far away, my photos didn't come out well, nor video. The best I can offer you with my travel camera is the above shot taken through a high-powered scope. Twenty years ago, the Tambopata Research Center was set up to study and protect the local Macaw population. These are the kinds of large, colorful birds I'd only ever seen in zoo's, so it was a treat to be around so many in Tambopata. One morning, we woke up before dawn and took a boat ride to the island from which I'd seen the caiman above. 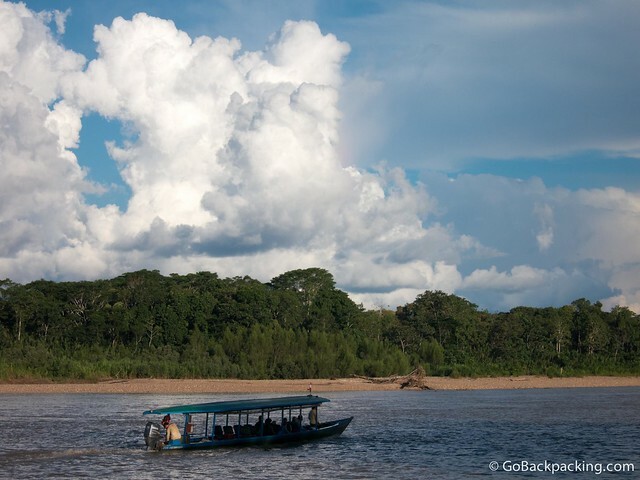 We watched the jungle come to life around the Amazon's largest claylick. As we learned in the Macaw lecture the night before, these birds eat clay to help with their digestion. Strange, but true. Unfortunately, while they are intelligent birds, they are also highly sensitive. If their scouts sense a threat, the rest of them won't come down from the trees to eat. And that morning, a Roadside Hawk had camped out with a terrific view of the section of claylick most visible to us. There were other sections that were hidden behind trees and foliage, where our guides said they were probably feeding. The irony was that our best views of the Scarlet Macaws were not during nature walks, but when the “Chicos” or human-raised macaws would visit the dining area at the Research Center every morning, looking for handouts after breakfast. These particular macaws don't fear humans, which is evident when they are lured onto visitors' shoulders with a piece of bread. As a result of this non-natural behavior, Macaws are no longer hand-raised. Instead, the researchers climb the trees and study them in their nests. This activity increases greatly around breeding season, toward the end of each year. As much as I've learned to appreciate birding over the years, I'm more of a monkey man. After lunch, we spotted spider monkeys on a walk. It was the fourth species that day. The following day, I'd see my fifth (and the one with the funniest name), Dusky Titi Monkeys. 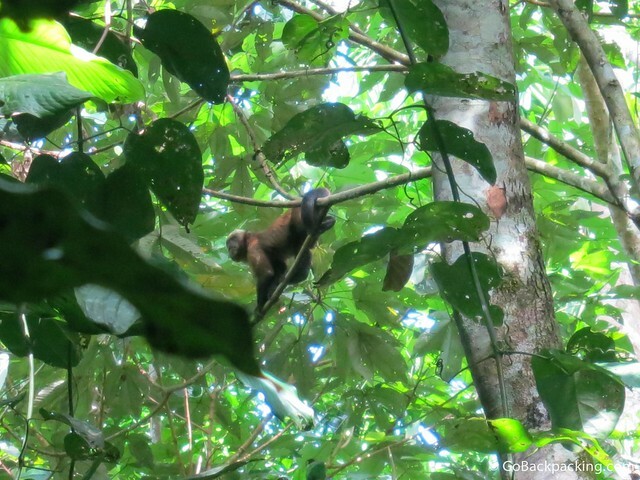 If you love monkeys, go to the Tambopata Research Center, they're everywhere! Without a shadow of a doubt, the Jaguar spotting which occurred one hour into our first boat ride on the Tambopata River was the wildlife highlight of my time in Peru's Amazon Basin. Because this particular big cat is so rare, with approximately 99 in the park, everyone on the boat, our guides included, got excited. 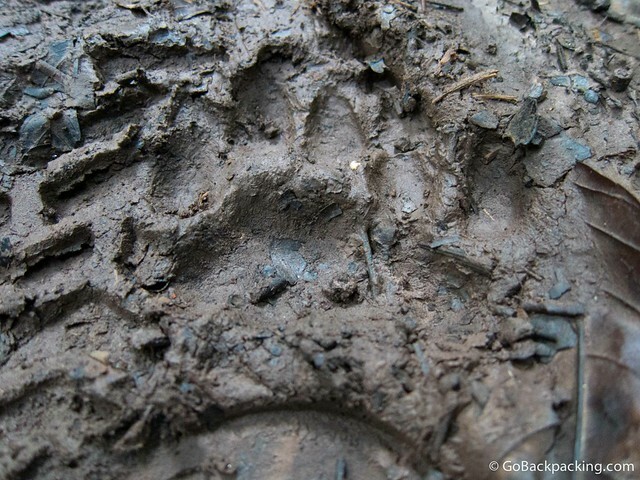 People go on multi-day jaguar tracking treks throughout the jungles of Latin America, and many will never see more than a paw print. The next day, during one of the walks around the Research Center, we came across one such Jaguar paw print in the mud. Later that afternoon, another group came back to the lodge, having seen a jaguar on the ground, just 10 minutes from where we were standing. So if you love jaguars, go to the Tambopata Research Center! Disclosure: This tour is in partnership with Rainforest Expeditions. As always, any opinions expressed are entirely my own. Thanks – I now officially have the “willies” after seeing that tarantula! Sounds like you had some great wildlife experiences. I remember my guide in Ecuador talking about the elusiveness of the jaguar. What a rare experience! Thanks Beth, it was a lot of fun. I can’t wait to visit the Amazon again. We saw feeding piranha splashing around in a lake at sunset, but I want the chance to fish for them, and eat them too! You certainly enjoyed your vacation! Jummpin Caribbean Deal website has the latest hotel and vacation discounts and deals for travelers. I have to agree with every one of these moments. I just got back from the same trip a few weeks ago & saw exactly the same things; our macaws didnt get so close but we DID see a jaguar while at the claylick blind. The pic i have of it doesnt really look like anything other than a shadow but it WAS there!